There are many things to like about Graham Neville cooking; Not only does he serve some exquisitely refined cooking but he also remains true to the provenance of the produce he uses going to the extent of cultivating some of the vegetables and herbs he serves in his restaurant. It represents what a talented and ambitious young Chef with a serious Culinary pedigree, as he previously worked with the Michelin Star Chef Kevin Thornton, think what Irish Cuisine should be about nowadays and let’s not forget the address as it couldn’t get any better. 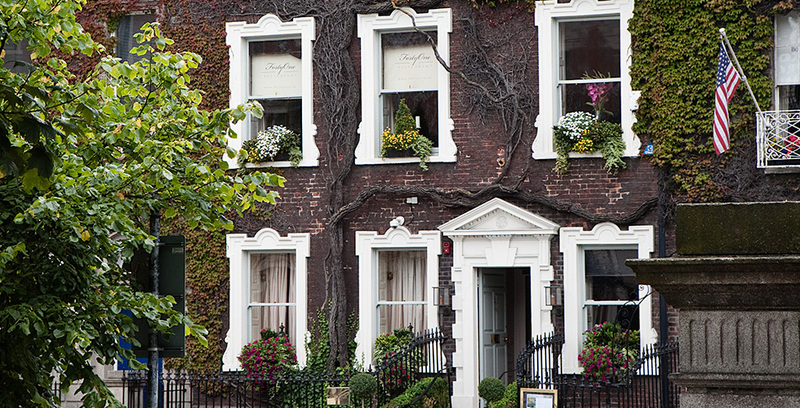 Occupying the first floor of what must be one of Dublin’s finest town houses, an ivy clad Georgian building, overlooking St Stephen’s Green is Restaurant Forty One. With wood panelling, over sized gilt mirrors and heavy damask, the decor is opulent yet very very elegant and exudes old world charm. We were immediately at ease in the cosy dining room. Tables are well spaced out and seating very comfortable. The staff are poised and flawlessly professional. We started with an Amuse bouche of Chicken Ravioli & Porcini Mushroom. A single ravioli sat in a pool of fragrant mushroom cream. It was magnificent with great depth of flavours. My starter of Annagassan Smoked Salmon with Clogherhead crab was elegantly presented, topped with a lattice of fine match sticks of Granny Smith Apple, a flavour constellation of finely chopped capers, red onion, egg yolk, egg white and salmon roe. The Crabmeat was sweet and perfectly seasoned while the wafer thin Smoked Salmon was delicate with just a hint of smokiness. This was no conjuring game, as both produce sang the authenticity of their provenance. Across the table, an irresistible plate of Warm Foie gras and Seville Orange was being savoured. Perfectly seared, silky it melted like butter in the mouth with the distinct sensual taste of good foie gras while the southern Spanish oranges added just the right amount of sweetness and citrus undertones. Our mains of John Dory stuffed with a Prawn Mousse, Wild garlic, Artichoke, Noilly Prat Sauce was exactingly executed and delivered. Again, perfectly seasoned and cooked fish with the ethereal texture of the prawn mousse and slivers of Wild garlic as a garnish. It was pure bliss. What intrigued about this dish is that it managed to be light but delivered a full punch of comfort food pleasure. How, I so wished I had taken a second helping of bread from the starter now, to mop up all that Noilly Prat vermouth sauce. But duty called from across the table in the form of Moulard Duck Breast, Fondant potato, Savoy Cabbage and Heritage Carrots. 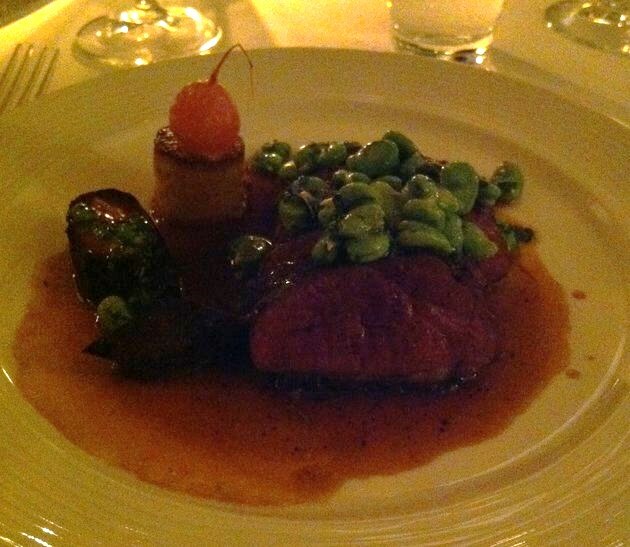 Beautifully seared Duck Breast, still pink as it should be was very tender and packed with flavour. The accompanying accoutrement were also perfectly executed. It was obvious at this point in our meal that making things taste of what they are is Graham Neville ethos and the way he goes about delivering this is indeed thrilling. For dessert, a Millefeuille, Praline. Butternut squash and roast lemon puree, While it tasted very good, it lacked a bit of finesse in presentation. However across was a sweet smelling Warm Irish Orchard Apple Tarte Tatin, Bourbon Vanilla Ice Cream, it was classic in its approach but my god it tasted divine, with perfect pastry, fruits with still a bite and delicious caramel, With the ice cream , it delivered a perfect mouthful in textures, temperature and flavours. There is no doubt in my mind that Graham Neville is on the starting block as one of the next great Irish Chefs and if you haven’t visited Restaurant Forty One yet, then you are missing out on something very special.